A startling departure from director Ridley Scott, who is usually more interested in technology and action than psychology and drama, Matchstick Men benefits from a neurotic Nicolas Cage performance, but not much else sets the movie apart. Roy (Cage) is a master con-man with issues: under stress he stutters, suffers almost uncontrollable facial ticks, is a carpet cleanliness freak, and has paranoid habits. Roy's wife left him while she was possibly pregnant with a child that Roy never got to meet. But along with his partner Frank (Sam Rockwell), he manages a comfortable living pulling off relatively small-time cons selling useless junk to seniors and emptying their bank accounts. Frank suggests that Roy visit psychiatrist Dr. Klein (Bruce Altman) for treatment. Klein helps Roy with his medications and also helps him find and for the first time connect with his now teenage daughter Angela (Alison Lohman). Soon Angela has moved into her father's house and is enthusiastically drawn into his life of crime. When Frank and Roy go after a big score to con a businessman out of a large sum, Angela's involvement complicates matters to dangerous levels until Roy finds himself staring at the biggest con of all. 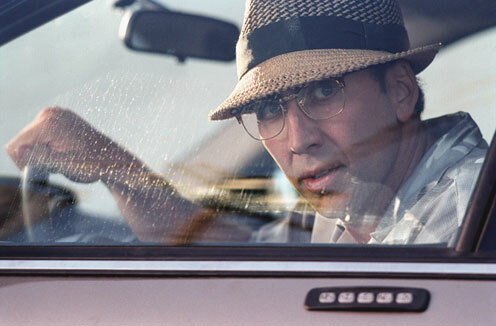 Matchstick Men is primarily a character study, and Cage is quickly able to make Roy a sympathetic character despite his long list of faults and weaknesses. The physical signs of stress and paranoia are almost over-played, but since Roy exclusively occupies the centre of the movie, Cage gets away with it. He is surrounded by a bland performance from Rockwell, and a predictable one from Lohman. Other than Cage there is not much drama or tension being generated, but he single-handedly provides enough energy to push the film forward. As a con movie, Matchstick Men does not try to reach for the duplicity levels of The Sting or House Of Games, and Roy's psychological issues intuitively limit his abilities to pull off a big score, and make him susceptible to the tricks of others. Scott does the right thing to focus on the people rather than the games; it's just that there is only one interesting man among the Matchstick Men.